About Fibercrete and Concast. Inc. Drawing from more than 49 years of research and experience, we have developed Fibercrete® , which is a proprietary blend of high strength concrete reinforced with special fibers and sometimes using steel reinforcement. Fibercrete makes possible the production of light weight, thin-walled, precast concrete parts. These cutting edge products can replace more massive units built from ordinary, steel-reinforced concrete. We offer the best advice and service because our engineering, manufacturing, and sales forces are passionate about our products. We will do everything in our power to get you the right product at the right value for your project. We constantly strive to stay abreast of the latest precast industry technology. We are active members of the National Precast Concrete Association (NPCA), American Wind Energy Association (AWEA), and the American Concrete Institute (ACI). To ensure that we are continually supplying quality products, our plant is certified by the NPCA annually. Concast was founded in 1969 by Mr. Ben Tilsen; past owner and president. Ben was a concrete technologist known for his work in lightweight aggregates and fiber reinforced concrete. He and Concast, Inc. hold patents on material and design in these fields. 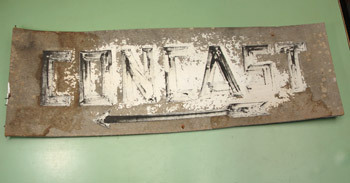 The photo on the left is a sign remnent from the original Rosemount, MN plant.